Time to Get Pumped: When you launch FitnessBuilder, you can get started with the pre-packaged exercise routines in iPump Workouts or create your own program with Workout Builder. FitnessBuilder—which bills itself as your personal trainer—is all about volume, interactivity, and variety: It offers some 400 built-in workouts for different levels and goals and a comprehensive library of some 4,000 original fitness videos and diagrams, demoed by both male and female trainers. This app is amazingly deep, rich, and detailed, but nonetheless very easy to figure out without having to consult the extensive documentation. It pretty much holds your hand through the process of selecting and building a workout routine, tracking your progress over time, and sharing your results with others. Because of the volume of exercises, you’re guaranteed never to get bored with your routine. And, of course, once you set up your workouts, you can use your own music to exercise by. FitnessBuilder launches into a simple interface, comprised of four main sections: My Workouts, iPump Workouts, Next Workout, and Workout Builder. If you’re new to the program, you can dive directly into iPump Workouts or Workout Builder. 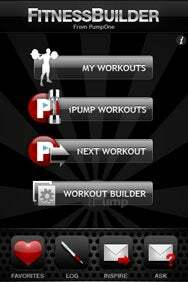 iPump Workouts (some of which were sold separately before FitnessBuilder was released, and which are now included in this larger app) are pre-packaged routines that you can tailor to your location, goals, and even specific body parts. For example, you can choose Home (or Hotel, Gym, Home Gym, Outside, or No Equipment) and Goal such as Abs (or Cardio, Full Body, and more). From those choices, FitnessBuilder displays a series of targeted workouts. Four icons at the bottom of the home screen let you choose from your favorite routines, your log, and two different types of e-mail—Inspire and Ask. Ask goes directly to PumpOne with your fitness questions. Inspire is a kind of community builder wherein you can e-mail your log and some chosen comments to your friends or family. Watch and Learn: Exercise instructions, accompanied by helpful photos, help you quickly pick up the routines in FitnessBuilder. The program’s Workout Builder lets you choose from thousands of exercises to create custom workout sessions. Using an innovative filter wheel interface, you can select a body part, muscle group, or category of exercise and pair that with equipment, such as barbell, Swiss ball, or leg weights. Like the iPump Workouts, Workout Builder is designed to create exercise routines for any location—from a fully equipped gym to your bedroom, with anything from professional benches and barbells to just your own body weight. As you choose your preferences, the app digs into its library to pull out exercises that match your criteria. A small image preview lets you see whether the exercise is what you have in mind. For example, if I see a Swiss ball in the picture, and I do not have a Swiss ball, then I would not choose that exercise. A comprehensive drag-and-drop interface allows you to choose individual exercises from FitnessBuilder’s library to create your own sequence. Once you pick a routine, you get into the heart of the program. Each screen represents one exercise in a zoomed view; you navigate through each of the exercises via a finger swipe. Each screen gives you an image and text tips about how to perform the exercise, presents a video option (for which you must have an Internet connection). Double-tapping on any workout reveals an interface in which you can track your routine by adding sets, reps, and weight. A single tap brings up an adjustable rest timer that you can manually start or stop. If you’re listening to music and want to see an exercise video, just tap on the video icon. The music fades out, the video plays, and you just tap on the iPhone controller to go back to your song. All these features worked well. The app’s Next Workout technology provides you with additional workouts based on the ones you already chose. iPhone users can even use the built-in camera to create an original exercise from scratch, complete with text and demo images. I have some fairly minor complaints about FitnessBuilder. The e-mail navigation is a bit disorienting because, when you finish sending the email to PumpOne via the Ask or Inspire mailbox, you wind up in the Mail app instead of in the exercise program; the only way to get back to FitnessBuilder is to relaunch the app. Sometimes the search criteria brought up unexpected results. When I click on Abs and DumbBell, I expect the resulting exercises to include only those things. 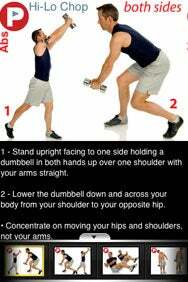 However, often such exercises included other equipment such as a Bosu or Swiss ball. When I chose leg exercises with leg weights (which I have), the only five matches also included a Swiss ball. The search function with the filter wheel is not designed to work in tandem with the text search to narrow down results; instead, you would use one or the other search technique. Still, if you want to create a comprehensive exercise program with routines that you choose and like, and would like some intelligent and automated assistance in suggesting related workouts, consider iPump FitnessBuilder. It allowed me to work out to my own music, let me track my progress, and provided much variety. FitnessBuilder is compatible with any iPhone and iPod touch running the iPhone 2.x software update.